Dr. Anita was fine but the head optometrist was clearly money hungry and not helpful. Make sure they take your insurancebefore you go there. They will charge you for just walking in. Dr. Anita was fine but the head optometrist was clearly money hungry and not helpful. Make sure they take your insurance before you go there. They will charge you for justwalking in. Communication during the exam definitely could improve. I was not aware the annual exam involved having my eyes dilated.I also was not told until after the drops were put in my eyes that it was to dilate them. I had to return to work after where I could not see my computer screen for the next 2 hours and was put behind as a result. Should definitely tell patients what all is involved in the exam before getting started. My contact lens prescription was also reduced significantly, and I could not see with new prescription. Ended up having to go to a different doctor to get my prescription increased to where it should be. Communication during the exam definitely could improve. I was not aware the annual exam involved having my eyes dilated. I also was not told until after the drops were put inmy eyes that it was to dilate them. I had to return to work after where I could not see my computer screen for the next 2 hours and was put behind as a result. Should definitely tell patients what all is involved in the exam before getting started. My contact lens prescription was also reduced significantly, and I could not see with new prescription. Ended up having to go to a different doctor to get my prescription increased to where it should be. 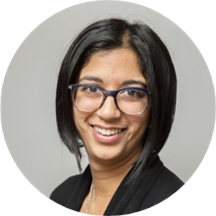 Anita Patel is a caring and diligent optometrist serving the community of Chicago, IL. Dr. Patel attended the State University of New York, where she received her degree in optometry. Dr. Patel is a part of Mary Szatkowski-Pritikin, MD. Patients see her for a variety of reasons, including eyeglasses, glaucoma consultations, eyelid problems, flashers and floaters, and eye infections. Dr. Patel speaks English and Spanish fluently, which makes her widely accessible to patients from a variety of cultural backgrounds. Outside of her practice, she enjoys travelling, skiing, cooking, photography, and knitting. Dr. Patel is sensitive to the uniqueness of each patient's situation and adapts her consultations and treatment options appropriately to accommodate individual needs and concerns. Patients trust Dr. Patel’s expertise because she consistently provides high quality care that leads to positive and lasting health outcomes. Had a red eye for 2 days and it was a very quick visit. Actually surprised by how nice the office was. Doctor was good at explaining what happened and I was gone in 20min. Dr. Patel was great. She was very efficient and got me in and out quick which is great for a lunch appointment. Very easy to talk to. Treated me with respect. Kind, compassionate, smart, knows her stuff. She was very nice and easy to talk to. Amazing service and staff! Would definitely recommend this office to others. Very happy. Everyone was incredibly nice and helpful. Dr. Patel was extremely approachable and answered every question I had. Easily the most thorough, efficient, and welcoming eye appointment I've ever had. Will absolutely be returning. Great visit, I'll be seeing Dr. Patel for eye appointments in the future as well.